Toronto’s St. Lawrence Market neighbourhood was once primarily an industrial zone, but a revitalization project-=launched by the City of Toronto in the 1970s-heralded the beginning of its transformation into one of the city’s most distinctive areas. Today, the neighbourhood offers an eclectic and energetic combination of the old and the new, with the classic character of the district’s historic buildings interspersed with modern condominium complexes. 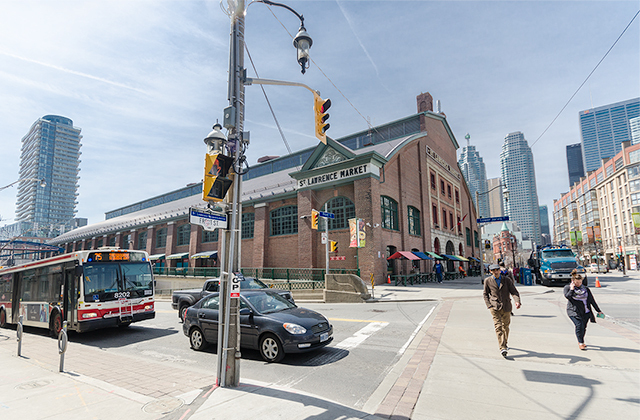 Centrally located and within easy walking distance of countless downtown Toronto attractions, the St. Lawrence Market area has been hailed as a triumph of urban planning and consistently ranks among the city’s most liveable neighbourhoods. Though its boundaries are somewhat fluid, it is largely contained by Yonge Street to the west, Queen Street to the north, Parliament Street to the east, and the CN railway lines to the south. In addition to housing the St. Lawrence Market, the district was also an important hub for shipping, transportation and commerce during Toronto’s early “boom years.” However, the area began to decline in the 1920s, when the railway lines servicing central Toronto were moved to what is now Union Station. By the middle of the 20th century, the industrial buildings in the area were largely abandoned, and the farmers’ market was one of the only old features of the neighbourhood which continued to thrive. This prompted former Toronto mayor David Crombie to launch a carefully planned revitalization project during the 1970s, which did not come to full fruition until the 1990s. 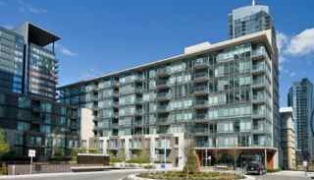 However, Crombie’s vision for a mixed-use neighbourhood blending the old and the new was eventually realized. 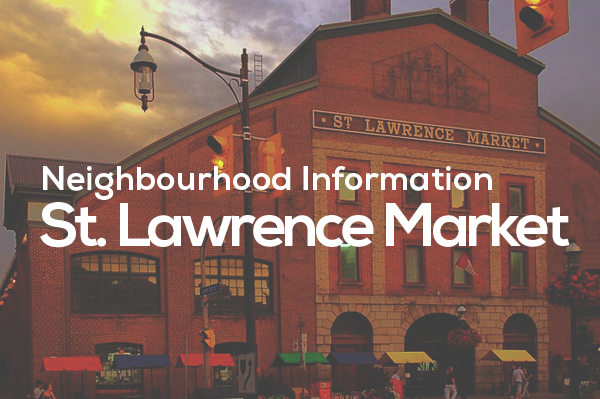 Today, the St. Lawrence Market area is one of the city’s most popular and sought-after downtown neighbourhoods. 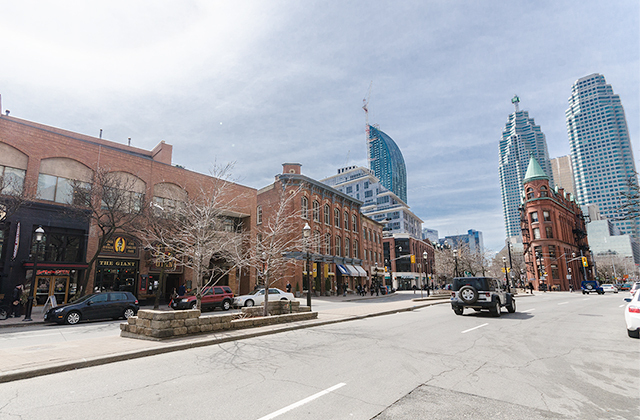 In terms of residential real estate, the St. Lawrence Market neighbourhood offers two primary options: lofts and condominiums. The district’s loft conversions have largely been constructed in repurposed industrial buildings. A typical St. Lawrence Market loft offers attractive and trendy design features including generous floor plans, soaring ceilings and exposed interior brickwork. St. Lawrence is one of the most conveniently located neighbourhoods in Toronto. Union Station lies within easy walking distance, where travellers can catch both branches of the Yonge-University-Spadina TTC subway line as well as commuter trains and intercity streetcars. Several major north-south driving routes sprout from the district, including Yonge, Bay and Jarvis Streets, and eastbound and westbound streetcars can easily be reached via King or Queen Street. The Gardiner Expressway lies just south of the St. Lawrence market area, offering convenient connections to the Don Valley Parkway as well as Highways 401 and 427. Also giving quick access to the 401 is the Don Valley Parkway which is just to the East. It has been voted one of Toronto’s best autumn drives. Scenic Lake Shore Boulevard offers drivers an alternative to the Gardiner, and is easily accessible from Yonge, Bay, Lower Jarvis and Parliament Streets. 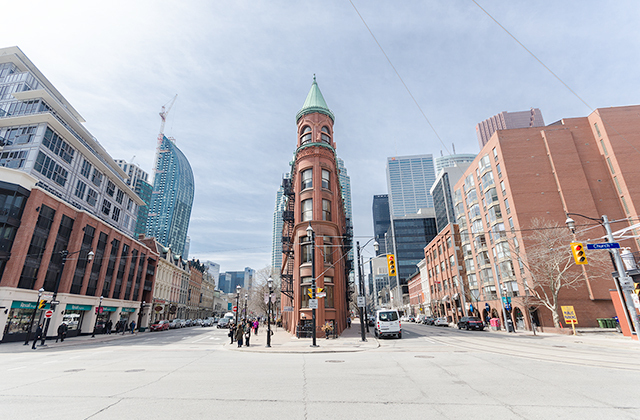 As one of the oldest developed districts of Toronto, the St. Lawrence Market area has many points of interest and landmarks for history buffs, including the Cathedral Church of St. James and the Gooderham Building. 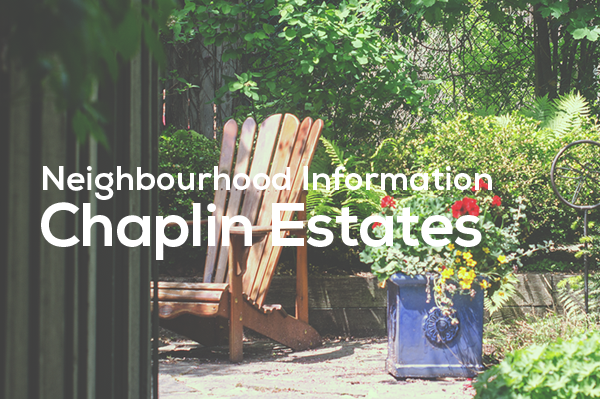 Given the neighbourhood’s central location, real estate is at a premium and the area’s green spaces tend to be fairly small and contained. David Crombie Park, named for the Toronto mayor who spearheaded efforts to revitalize the area, is a placid tree-lined space running along the Esplanade. 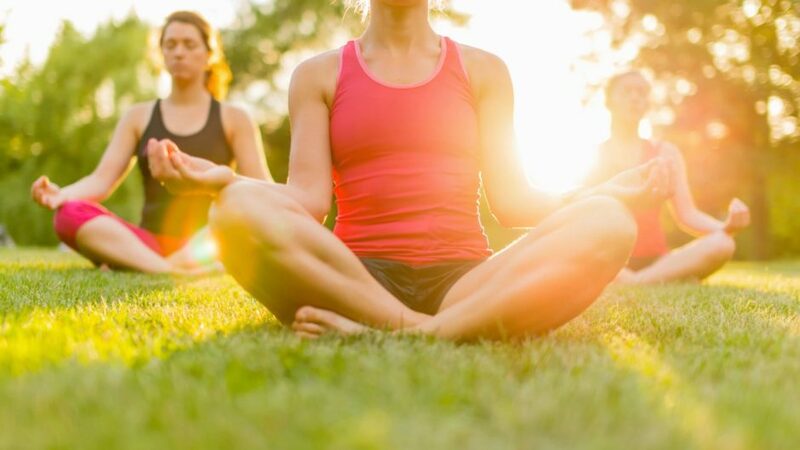 Those seeking a respite from the urban hubbub can venture to Parliament Square Park, located on Parliament Street in the easternmost corner of the neighbourhood. The Toronto Island is also just moments away and offers acres of parkland, beaches, bike trails and the famous Island amusement park. An incredible number of cultural and recreational facilities are concentrated in and around the St. Lawrence Market area, including the St. Lawrence Centre for the Arts, the Imperial Oil Opera Theatre, the SONY Centre for the Performing Arts, and Toronto’s thriving theatre district. Roy Thomson Hall and Massey Hall are also within easy walking distance of the heart of the neighbourhood. The Parliament Interpretive Centre, operated by the Ontario Heritage Trust, is located at the intersection of Front and Berkeley. The centre offers visitors a glimpse into the neighbourhood’s long and storied history, and provides detailed historical information about the Upper Canada legislative buildings which once stood near Parliament and Front Streets. Area residents can also take advantage of the St. Lawrence Community Centre as well as Moss Park Hockey Arena, which offers full-service facilities to youth players and members of adult recreational leagues. Market Lane Junior and Senior Public School offers instruction to students in Junior Kindergarten through eighth grade, and the Downtown Alternative School offers educational programs to students of elementary school age. Would-be residents should note that the Toronto District School Board’s enrolment policy is heavily based on geographic location; questions about enrolment in nearby public schools should be directed to board representatives. Also, keep in mind that all Toronto private schools set their own enrolment and admissions policies; be sure to check with the admissions department of any private school you are considering prior to your move to the St. Lawrence Market area, as geographic boundary restrictions may also apply. As one of the best-located and most popular neighbourhoods in Toronto, the St. Lawrence Market area is naturally home to a staggering range of restaurants, grocery stores and amenities. In addition to the actual farmers’ market, residents can take full advantage of a refined and upscale culinary culture which includes gastronomic delights such as Canoe, George, Kultura, Ki and Trevor. The world-famous Harbour Sixty Steak House is also within walking distance. Beer lovers rave about the Bier Market, a wildly popular bar and restaurant offering dozens of fine beers from around the globe. Flagship Sobeys, Metro, Loblaws, and LCBO locations are also located in close proximity to St. Lawrence Market. Jethro Seymour is one of the Leading Toronto Real Estate Brokers at Royal LePage RES Ltd., Johnston & Daniel Division. Jethro is a midtown Toronto residential specialist with over 20 years of sales experience in real estate, marketing, construction and publishing. He has helped many families find homes in Toronto’s great neighbourhoods, and has extensive knowledge of local markets, new home construction, resale home sales, and the condo market. Living in midtown Toronto, Jethro previews many of the homes that come to market for his clients and inventory knowledge. Jethro specializes in the Midtown, Davisville Village and Leaside neighbourhoods.